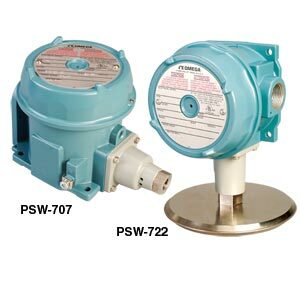 The PSW-700 Series pressure switch is built for the rugged industrial setting. The internal set points allow adjustments while keeping the electrical component isolated from the environment. The internal and external set points have a range scale allowing fast and easy set-up. Ambient Temperature: -50 to 71°C (-58 to 160°F), except for models 703 to 705 which are -18 to 71°C (0 to 160°F). Setpoint typically shifts less than 1% of range for a 28°C (50°F) ambient temperature change.